High Sierra luggage stands for practical performance and outdoor activity. High Sierra versatile adventure lifestyle travel gear is just what adventurers everywhere need and like. 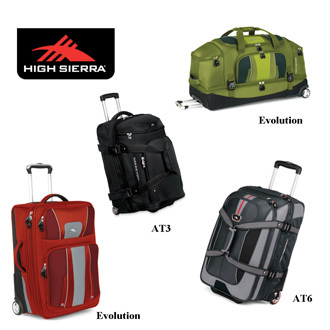 High Sierra offer wide range of luggage to fit all kind of adventures, home or away. Let's look at their most popular luggage range in more detail. 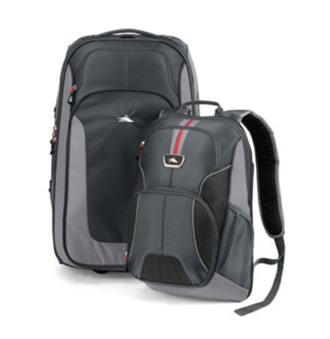 The High Sierra Collections is a range of good-looking high performance travel bags. Functionality and durability are the keywords in the design. The range consists of suitcases, backpacks, and duffels, with or without wheels. There are number of sub ranges, focusing on certain aspects of adventurous travelling. The High Sierra AT3 range offers you maximum flexibility, as most bags in this range are more than one bag. You get three bags in one as you can use them as wheeled upright bag, duffel or backpack. We love the flexibility that the High Sierra AT3 range offers. The High Sierra AT6 range merges style, practical features and advanced engineering. This is a range of lightweight High Sierra wheeled duffels, backpacks and carry-on travel bags. Again, functionality and flexibility are key features. These are travel bags for those serious about adventures and new experiences. The High Sierra Evolution range is the lightest High Sierra luggage range (so far). Unique built-in high-density internal foam structure helps maintain the shape while minimizing the weight. The Evolution range includes the only High Sierra wheeled luggage, as well as backpacks and wheeled duffels. Our favorite High Sierra backpack is not only three bags in one. You can unzip the bag on the front and then you have separate daypack. This gives you great flexibility when on the road. You can use both bags for your belongings when going from one place to another. You can either wheel your loaded bag or carry it as backpack with the hidden padded backpack straps that are stored behind the zippered back panel. When you have unpacked at your destination, you have separate day backpack that is great for your daily excursion or on shorter outings, e.g. when overnight stay is included. We love the flexibility this offers... and they look good too. We traveled around the world with separate wheeled bag and daypack. We would have loved to be able to attach our daypack to your main bag when moving between places. You can get High Sierra backpack with removable daypack in different sizes and colors. The High Sierra Backpack range consists of the High Sierra Collections backpacks already mentioned and series of day backpacks. The High Sierra daypacks are durable and full of practical features, like mesh padded shoulder straps, heavy duty zippers, great internal organization, spacious main compartments and earphone ports. The look is varied. There are traditional looking ones and trendy ones. Everyone should be able to find a High Sierra daypack to fit his or her style. The High Sierra Duffel range consists of the High Sierra Collections duffels already mentioned and series of sporty hand held duffels. Some duffels offer some smart extras. Like the duffel pictured that carries your water bottle and has ventilated athletic shoe pocket for your (smelly) shoes. This is a great bag, home or away. 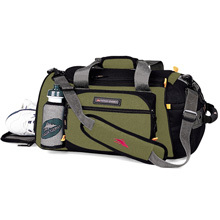 High Sierra also offers number of Pack-N-Go duffels, which offer you great flexibility, e.g. in case you do some shopping at your destination. 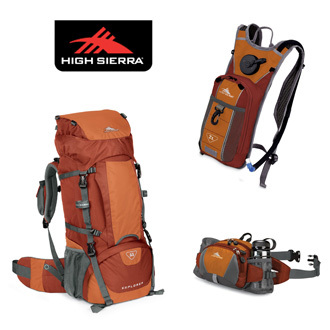 High Sierra offers range of travel products for the seriously active travelers. The High Sierra Hydrations Packs help you to stay hydrated when out and about, whether hiking, running or cycling. They come in various shapes and sizes and with lot of extra practical features for active travelers, home and away. The High Sierra frame packs allows you to go farther and higher. They are lightweight and roomy and include features you expect to find in only the most expensive packs (at the fraction of the price). Like top-loading main compartment, top and bottom pack access, bottom sleeping bag compartment, hydration-ready design and plenty of accessories to hold gear like hiking poles and ice axes. Frame packs are for those that take adventures seriously. While High Sierra Lumbar Packs are great for short day excursions or just when out and about. Lumbar packs are surprisingly spacious and should hold all your everyday essentials, including water bottle to keep you hydrated. High Sierra of course caters for those that are into winter sport as well, offering range of ski and snowboard bags, boot bags, and daypacks perfect for the slopes. Amazon offers wide range of High Sierra bags. These are some of favorite B for Bag High Sierra bags.